Southeast Asian leaders dropped a reference to concerns over China's disputed territorial claims in the South China Sea from a statement released Thursday, apparently reflecting the power wielded by the economic powerhouse in the region. The 28-page chairman's statement that summed up discussions at Monday's summit of the Association of Southeast Asian Nations in Manila instead said the leaders "took note of the improving relations between ASEAN and China." For the first time in several years, the chairman's statement did not express "concern" at and excluded references to specific activities by China in the South China Sea, such as building man-made islands with military fortifications. The statement issued after the leaders last met in April said "we took note of concerns expressed by some leaders over recent developments in the area," while making no mention of China by name or criticism of it. ASEAN documents issued on previous occasions contained even stronger language, with "concern" repeatedly expressed since 2014. A Chinese Foreign Ministry spokesman hailed the statement issued by Philippine President Rodrigo Duterte as "accurately portraying the current situation." Geng Shuang told a regular press briefing in Beijing that the situation in the South China Sea is "stabilizing and cooling" and the chairman's statement is in line with "this fact." The latest statement said the ASEAN leaders "look forward to the announcement of the start next year of substantive negotiations" with China over a Code of Conduct in the South China Sea. Philippine foreign affairs spokesman Robespierre Bolivar confirmed to Kyodo News that when ASEAN and Chinese officials meet early next year in Vietnam, the COC will be on the agenda. Four ASEAN members -- Brunei, Malaysia, the Philippines and Vietnam -- have competing claims with China and Taiwan in the South China Sea. 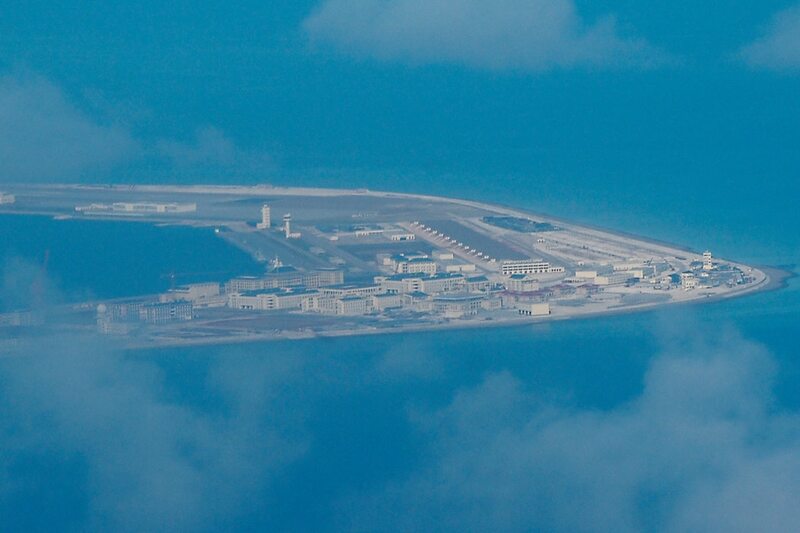 China claims almost the entire sea, and its reclamation of a number of disputed reefs and fortification of them with military features have sparked worries among other claimants. The disputes used to top the agenda at past ASEAN meetings, but challenged the 10-member bloc's unity as some member countries that rely heavily on China were unwilling to upset the Asian powerhouse. The Philippines used to be among the most vocal critics of China, along with Vietnam. However, since taking power in June last year, Duterte has taken a conciliatory approach to the disputes, placing higher priority on economic aid and investment from China. At a business forum on Sunday, one day before chairing the ASEAN summit, Duterte said, "The South China Sea is better left untouched, nobody can afford to go to war." The chairman's statement only said the leaders "emphasized the importance of non-militarization and self-restraint in the conduct of all activities by claimants and all other states." With regard to North Korea, the statement said the leaders "expressed grave concerns over the recent provocative and threatening actions, including the nuclear test" by North Korea on Sept. 3, as well as its "ballistic missile tests over the past year." On the Rohingya human rights and humanitarian crisis in Myanmar's strife-torn Rakhine state, the document said a number of leaders welcomed the launch of a government-led mechanism for providing humanitarian assistance. "They welcomed the commitment by Myanmar authorities to ensure the safety of civilians, take immediate steps to end the violence in Rakhine, restore socio-economic conditions and address the refugee problem through verification process," the statement added. ASEAN -- which also includes Cambodia, Indonesia, Laos, Myanmar, Singapore and Thailand -- continues to assess East Timor's application for membership, with a meeting set on Dec. 5 in Indonesia. Brunei's Dato Paduka Lim Jock Hoi will serve as the group's new secretary general from 2018 to 2022, the statement said.